APH Federal Quota Account - "Focus"
What is the American Printing House for the Blind (APH) Federal Quota Account? In 1879 the "Act to Promote the Education of the Blind" was passed. By this Federal Act, Congress created a permanent annual appropriation for the specific purpose of "manufacturing and furnishing books and other materials specially adapted for instruction" of blind students in the United States and its Territories. The Act and its resulting programs administered through the American Printing House for the Blind (APH) place the most appropriate educational aids, tools, and supplies in the hands and lives of each eligible person with blindness. The system through which these specialized materials are distributed is known as the Federal Quota Program. Through it, aids are provided free to eligible individuals with blindness in educational and rehabilitation settings. Today, APH manufactures an extensive inventory of commercially-unavailable educational aids, tools, and supplies which address the specific learning and rehabilitation needs that a vision loss creates. Materials available through the APH Federal Quota Program can be found in the APH Products Catalog. Be registered with MCB, and over the age of 18 and/or out of High School. Have had an eye exam within the past 3 years and can provide the name, address, and phone number of the eye care provider (ophthalmologist or optometrist). An APH Medical Eye Report form will be sent to the eye care provider to verify Legal Blindness. Have received a minimum of 20 hours of documented instruction per week for 12 weeks in the preceding calendar year from a rehabilitation or educational program; and be registered in the current calendar year to receive the same (a minimum of 20 hours of instruction per week for twelve weeks). Although social and leisure programs do not qualify as instruction, practice to develop skills can be used toward instructional hours. Mobile Day Services (for adults who do not attend a rehabilitative program, but who have a service plan with instructional and rehabilitation goals). How does a person become registered with MCB? An individual’s eye care provider (ophthalmologist or optometrist) must complete and send a Mandatory Report of Legal Blindness to MCB. 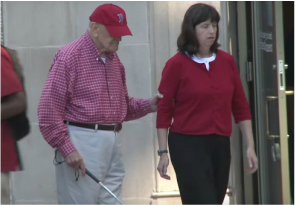 For more information please visit the Massachusetts Commission for the Blind website. How can an eligible adult register with the APH Federal Quota Program? When is the APH Federal Quota Account enrollment period open? ​Each adult meeting the APH Federal Quota Account eligibility requirements is invited to submit an APH registration form at any time during the year. The official yearly “open registration period” is from November until mid-February. Adults registered by mid-February each year can begin ordering on October 1st. How does the APH Federal Quota Program work? ​Once registered, MCB APH Federal Quota Account Ordering Information will be provided along with the yearly Federal Quota amount. Ordering Information will include directions for obtaining a paper catalog or viewing online. Each year, eligibility for every adult on the MCB APH Federal Quota Account will be reviewed. When can APH Federal Quota orders be placed? The yearly ordering period is Oct. 1st through Sept. 30th (the Federal fiscal year). Orders can be placed at any time during this period. What items can be obtained with through the APH Federal Quota Account? Items with the description “Not available with QUOTA funds”. Items not listed in the APH Products Catalog, and/or from non-APH catalogs. Check our APH Product Information page for ordering ideas and suggested use. The MCB APH account is for Adults, is there an APH Account for Children in Massachusetts? The Massachusetts Department of Elementary and Secondary Education (DESE) holds an APH Federal Quota Account for students enrolled in school up to age 22 through the Massachusetts Accessible Instructional Materials (AIM) Library. Please visit the AIM Library website or call 781-562-0461. For information on other APH accounts in Massachusetts, please visit the APH website. If a student is transitioning into adult services and has previously been on the DESE APH Account through the AIM Library, a transfer to the MCB APH (adult) account is not automatic. A new MCB APH registration form must be completed and sent to Lisa.DiBonaventura@state.ma.us . Prior account eligibility on the DESE APH Account is not needed for a young adult to be found eligible for the MCB (adult) APH Account.